MBOX to MSG converter is a complete standalone tool that allows the users to export multiple MBOX files to MSG format along with attachments. It also supports all .mbox based mail clients to perform the migration process. This tool supports all the Windows versions such as Windows 8.1, 8, 7, etc. 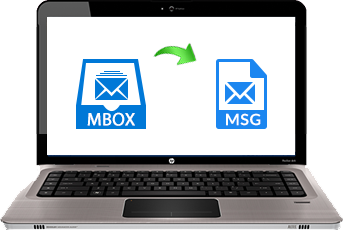 Convert Multiple MBOX Emails to MSG tool is designed in such a way allows to migrate one or more .mbox files to .msg format. 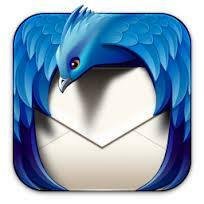 Even the users can add many MBOX files and saved all emails in MSG format. Also, it retains the data integrity after conversion of .mbox files. When converting MBOX files as MSG format the software provides the naming pattern to choose an appropriate name for saving each file. Moreover, there are various file naming conventions available such as Save as subject, DD-MM-YY, MM-DD-YY, YY-MM-DD, Auto incremental and so on. 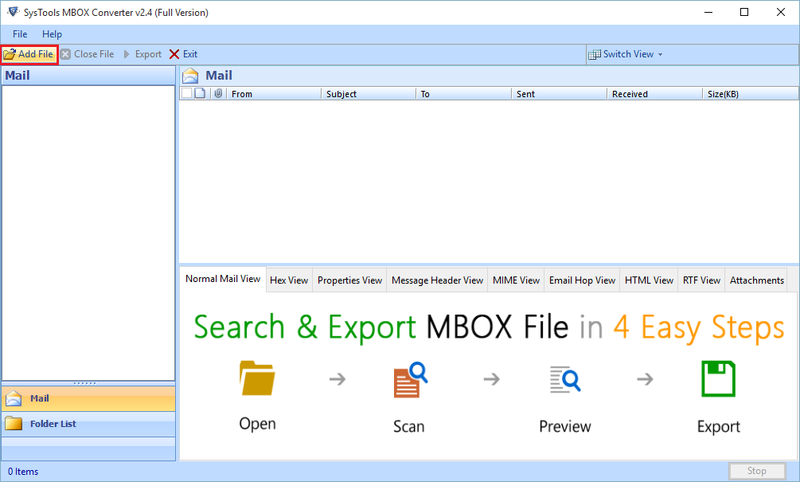 Convert Multiple MBOX Emails to MSG is a Windows-based application that helps to recover all MBOX emails along with attachments successfully. Additionally, this software supports both 32-bit as well as 64-bit versions of the Windows machine. MBOX to MSG conversion tool provides Auto Detect feature that automatically enables to detect the desirable location of .mbox file within the root directory. 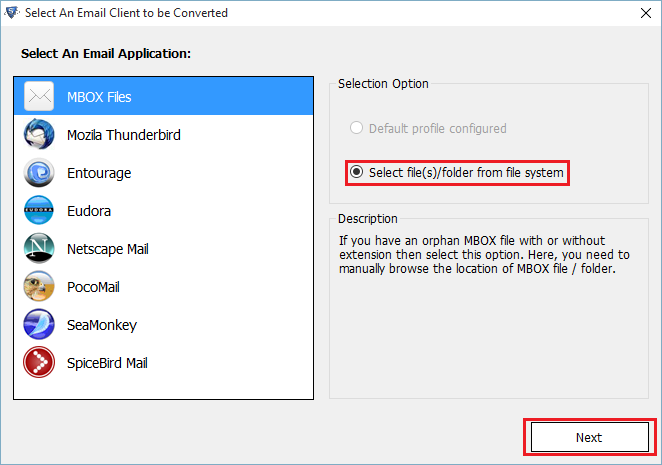 So, the Thunderbird MBOX to MSG converter will locate the MBOX data when user wants to choose the specific Folder. In order the software is programmed to export selective emails from MBOX and preserve them in MSG format. In simple terms, select each email and right-click on it to move them into the specific file format. 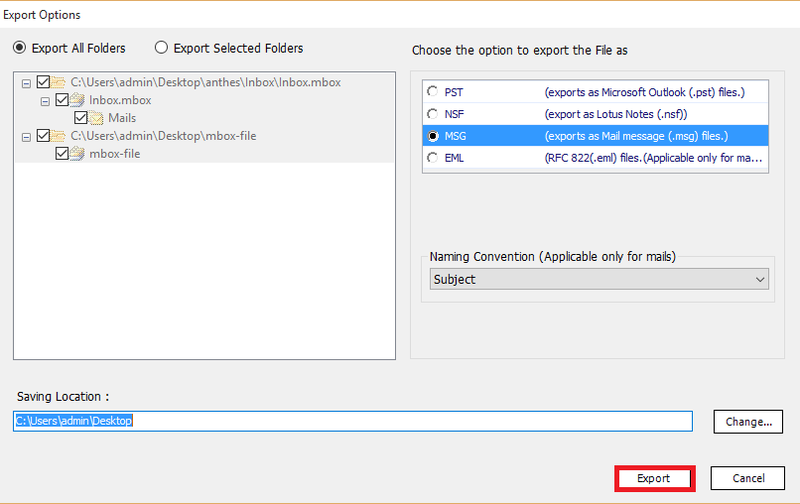 Otherwise, the users can check the particular folder to export MBOX format to MSG file type. MBOX emails to MSG Converter is programmed in such a way that it retains the integrity of data after conversion of MBOX file. It preserves email attachments, Meta properties, folder hierarchy, etc. in an original format. No changes required during file conversion to MSG format. Apple Mail to MSG Converter tool is mostly needed users of Apple Mail in MSF for Windows & Mac Both, which makes Apple Mail to PST Conversion one of the most demanding tool to perform Mac Mail into MSG file format. 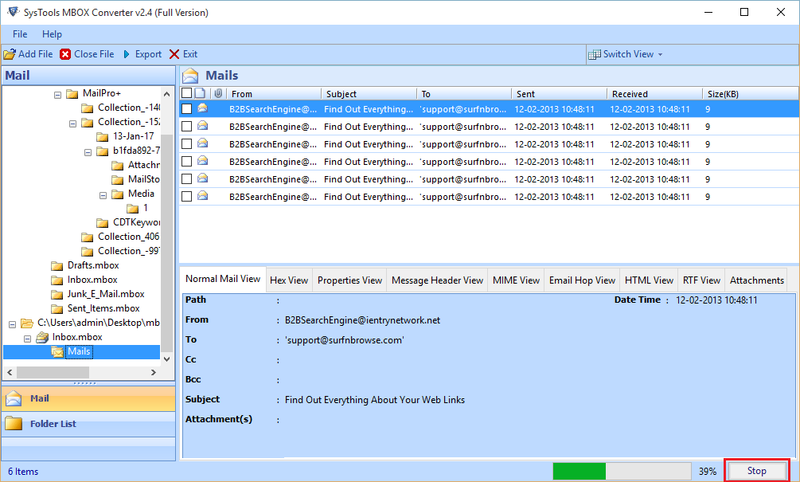 Eudora to MSG Converter tool, lets's convert Eudora mails with attachments directly to MSG. The Most straightforward and simple way to convert Eudora mailboxes to MSG file format. With Thunderbird Mail to MSG Converter, you can easily move emails from Mozilla Thunderbird Mail to MSG file in a simple way. Without hampering or affecting the accuracy of your messages, you can export each and every detail of your Thunderbird Mail messages to MSG files for Mac or Windows. For Conversion of Entourage MBOX to MSG file converter is to convert the multiple files to multiple formats. You can efficiently converts your your emails from MSG format with ease. Batch conversion for unlimited number of transformation of Entourage mails to MSG with encoding conversion. I must say MBOX to MSG Converter is an amazing solution to move all MBOX file. Moreover, it allows to perform the bulk conversion from MBOX Emails to MSG file format at once. It works perfect and I really want to suggest it to those users who are searching to export entire MBOX file into MSG file type. I liked this marvelous tool to execute the migration process. Thanks to the development team for making such an efficient tool. From past few months, I was planning to convert data from MBOX file to MSG format. But I was not getting the satisfactory result while transferring of data finishes in just a few clicks. Just joined the social networking site, I came across this wonderful software. MBOX to MSG Converter also helped me a lot to complete the migration process. The tool offers a hassle-free way to migrate emails with attachments in MSG file format. Great work!! I would like to thank the team members who initiated this Best MBOX to MSG Wizard with requiring intellectual effort. Really I am very grateful to the developers for coming up with a great product having an advance technology in it. Truly said, it is a recommendable Software. I had given numerous opportunities to get all my MBOX emails into MSG format. However, I was looking for the suitable utility that I can trust. Then, I found this MBOX to MSG Converter software and fell it on its first glance. After using this, I must say this application works nicely with multiple advance features. Thanks a ton!! Why MBOX Data Files Are Converted? Many users are looking this application which convert bulk MBOX files to MSG format. Reason being that this data conversion is only possible to convert the less files of MBOX to MSG file. But, bulk conversion is not an easy task to perform the migration process. Therefore, most of people wants to use an automated tool in an efficient manner. The MBOX to MSG Converter helps to perform the conversion process without making any modifications in the MBOX data. If the users want to move from Thunderbird, Eudora, Apple Mail like this to MSG format then they can take help of this reliable and incredible software without any hassle. The software can freely export multiple .mbox file to MSG format and even a novice user can uise this product without having any technical knowledge.